The West Valley Search and Rescue team is committed to serving others. The Team recruits for new members every year. Field rescuers are sought during even numbered years so they may begin their training program in February of the following year. Non-field Support personnel are recruited on odd-numbered years and also begin their training in February of the following year. Associate positions are filled as they become available. All West Valley volunteers are non-paid employees of the San Bernardino Sheriffs’ Department (SBSO). As such, all team members and recruits must comply with requirements set forth for volunteers by the SBSO. West Valley SAR has three general classifications available to its members: Field Members, Support Members and Associate Members. We invite all persons who are interested in joining our team to determine for themselves which classification best suits their interests and abilities. The West Valley SAR Team will provide all of the training a new recruit will need to become an effective team member. Recruits need only have a willingness to learn and a strong desire to help others in time of need. 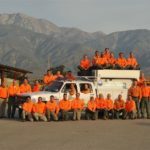 The West Valley SAR is looking for members who will volunteer at least five years of service to the community. Hundreds of hours of training are required to develop highly skilled rescuers, read to respond on a moments notice when lives are at risk.